The Cardinal Nation has published annual rankings of the top prospects across the St. Louis Cardinals system since 2006. 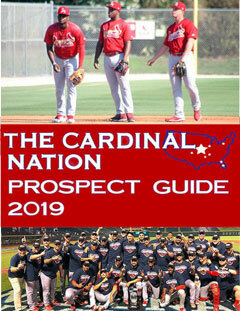 Once again here in 2019, we have compiled all of these reports and much more into a new 190-page book – The Cardinal Nation 2019 Prospect Guide. The core of this new 190-page Guide is in-depth profiles on all players on the top 50 prospect list, with each player write-up new for 2019. Individual profiles include 2018 stats, photos, scouting reports, probable 2019 team assignment, ultimate potential and more. In addition to the all-new player write-ups and dozens of additional photos, new sections for 2019 include top statistical performers last season, team records/standings, sourcing of the top 50, organizational Pitchers and Players of the Year and George Kissell Award history, both going back several decades. For full details on the contents of the Guide and how to order, either in print or electronic form, click here.